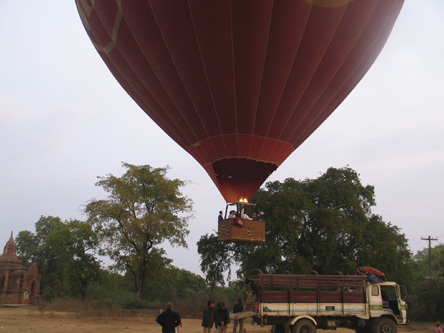 To see the panoramic view of Bagan in the early morning, we would like to offer you "Balloons over Bagan" services. The Balloons is operating from 20th October until 31st March (Premium Service) respectively until 10 April (Classic Service) each year. 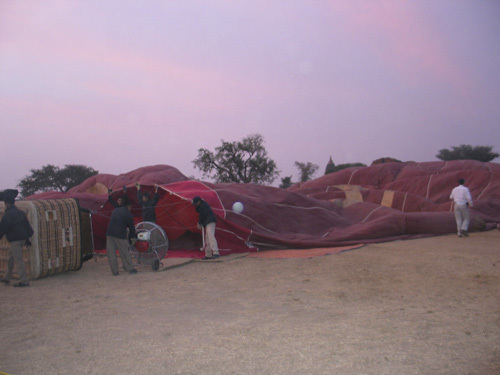 Our price for the Balloon-ride (Classic service) is 340.-- USD / Person for 20th October 2018 to 31st March 2019 and includes transfers to and from the Hotel, refreshments provided by Balloons Over Bagan. ****There is a peak-season surcharge of 20.-- USD / Person add-on for the flights during 18 December 2018 to 10 January 2019. Premium Service uses smaller balloons and provides a more discerning service! 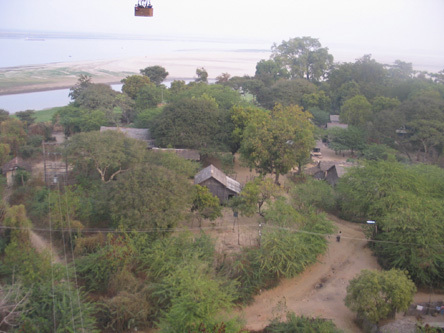 Our price for the Balloon-ride (Premium Service) is 440.-- USD / Person for 20th October 2018 to 31st March 2019 and includes transfers to and from the Hotel, breakfast by Balloons Over Bagan.. 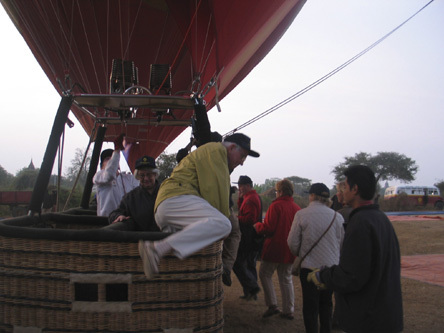 Balloons over Bagan since 2015 also offers balloon-rides at Inle Lake (Balloons over Inle). 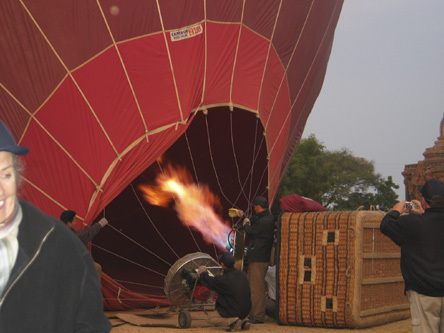 Our price for the "Balloons over Inle" Balloon-ride is 340.-- USD / Person. The ride there is more sophisticated to organize and the ride takes longer (1 to 2 hours). in the past, the operator used balloons for only 6 or 8 persons. We have a special promotion for guests booking Balloons with us until 31 July 2018 for any flight during the next Balloons season starting October 2018! 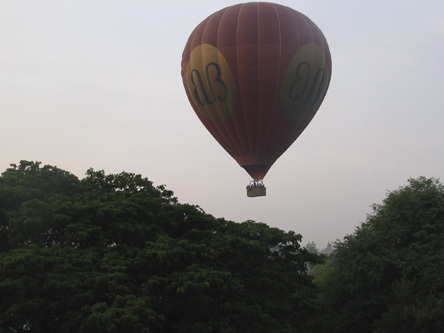 We grant on above Balloon fare a discount of 10.-- USD / Person. The peak-season surcharge remains unchanged. May be it looks expensive on your first consideration. But flying with a balloon is very special. At least you may try once in a lifetime and you will get unique experience that you will never forget and take the record of beautiful view of Bagan. As the operator uses professional equipment and has foreign pilots, the price may become understandable. There are morning flights (for sunrise) and maybe also evening flights. Evening flights can not be booked in advance and are only operated depending on weather conditions etc. We are very confident in the operator; they leave a good and professional impression on us and we have no doubts on safety. 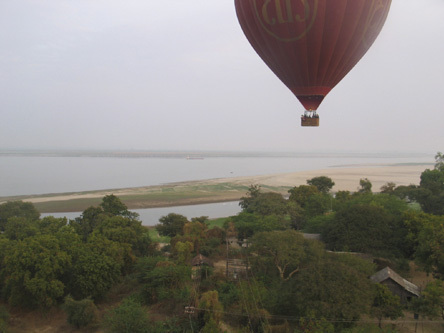 Balloons over Bagan was set up and run by Brett Melzer and Khin Omar Win many years ago and taken over recently by one of the largest companies in Myanmar. Landings in Europe seem sometimes to be very hard. 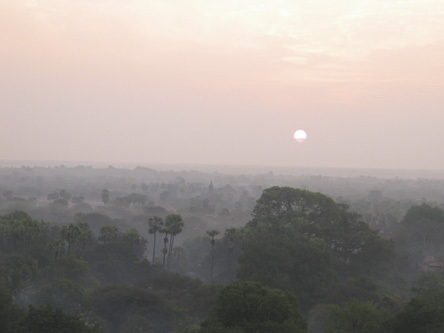 We have neither experienced that here in Bagan ourselves nor heard of from our guests. The landings are typically very smooth. It might be foggy in December and January. We hope that your flight will be on a day without fog, it however can not be ruled out. The flights are also operated if it is slightly foggy, which in fact can offer a nice silhouette. Normally we need the following details of guests who would like to book a Balloons flight with us. Booked and confirmed morning flights are not cancelled by the operator, even if there would be only a few participants. If the flight would need to be cancelled e.g. due to weather reasons, Fascinating Land Travels will refund the full amount. If the Balloon ride is the solely booking with us, we will refund you the full amount but deduct handling fees 20 USD (total) in order to at least cover our taxi expenses etc. The minimum age is 8 years. Minimum height is 4’6” tall (137 cm). We have to pay a 30% non-refundable deposit after the confirmation for the Balloon-ride and remaining payment 1 month before your flight.